This website was frozen on September 29, 2011. It is now a Federal record managed on behalf of the National Archives and Records Administration. External links were active as of that date. For technical issues, contact University of North Texas CyberCemetery. Welcome to the website of the Commission on Wartime Contracting (CWC), an independent, bipartisan legislative commission established to study wartime contracting in Iraq and Afghanistan. Created in Section 841 of the National Defense Authorization Act for Fiscal Year 2008, this eight-member Commission is mandated by Congress to study federal agency contracting for the reconstruction, logistical support of coalition forces, and the performance of security functions, in Iraq and Afghanistan. Section 841 requires the Commission to assess a number of factors related to wartime contracting, including the extent of waste, fraud, abuse, and mismanagement of wartime contracts. The Commission has the authority to hold hearings and to refer to the Attorney General any violation or potential violation of law it identifies in carrying out its duties. The Commission has issued two interim reports to Congress, “At What Cost?” (June 2009) and “At What Risk?” (February 2011), as well as five Special Reports on specific issues. PDFs are posted at the Reports section of this site. 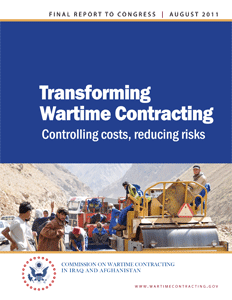 The final report to Congress, “Transforming Wartime Contracting: Controlling Costs, Reducing Risks,” was filed in August 2011. The Commission will sunset on September 30, 2011. From that date, this website will no longer be updated, but will remain online as an archive of the Commission’s work.